As a further education corporation, Furness College is ultimately led by its Board of the Corporation (Governors). Reporting to the Board, the College’s Executive Leadership Team (ELT) is responsible for the strategic leadership of the College and ensuring it achieves its vision and strategic objectives, whilst upholding the core values, all of which are set by the Board. Led by the Principal/Chief Executive, who is also an ex officio Board member, the ELT also comprises the Deputy Principal, Curriculum and Quality and the Deputy Principal, Finance and Resources. The wider Senior Leadership Team (SLT) is responsible for all aspects of strategic and operational leadership of the College, ensuring the highest standards of teaching, learning and assessment, outstanding outcomes for learners, and a strong and sustainable financial position. The SLT consists of all members of the ELT together with three Directors, each of whom have cross-college responsibilities. The College Management Team (CMT) includes all college managers and provides leadership and management across the whole college. Andrew Wren joined Furness College as Principal and Chief Executive in September 2015. Having grown up in Cumbria, he moved to East Yorkshire, graduating from the University of Hull in 1993 with a BA (Joint Honours) in French and Scandinavian Studies. After some time studying and teaching English in Linköping, Sweden, he began a career in hospitality and retail management, and undertook part-time teaching during evenings. In 2002, he moved full time into Further Education as a lecturer at Hull College, progressing to Head of School, before taking up a director post at East Riding College where he later became Vice Principal. He completed a Postgraduate Certificate in Education at the University of Huddersfield and a Post-Graduate Diploma in Management with the Chartered Management Institute. He is also a fellow of the Chartered Institution for Further Education, a Board member of the Cumbria Local Enterprise Partnership (LEP), Deputy Chair of the Board of St. Mary’s Hospice in Ulverston and a Governor at his son’s school. During his first year in post in Barrow, he led the successful merger of Furness College and Barrow Sixth Form College, securing the breadth of post-16 education in Furness. Andrew is committed to providing the highest quality provision and believes firmly that Further Education colleges, such as Furness College, have a critical role to play in providing learning opportunities to help transform the lives of individuals and impact positively on employers. Fluent in Swedish, he particularly enjoys reading modern Scandinavian literature in his spare time, together with crosswords, anything related to I.T. and looking after his brood of rescue chickens. At weekends, he can usually be seen out walking on the fells with his son Jacob, and two beagles Freddie and Ralph. Mark Nicholson has held his current post of Deputy Principal Curriculum and Quality since 2009, having first joined .the college as a Lecturer in Engineering in 1987. He has held a number of posts at all levels within the college, having completed a BSc in Electrical and Electronic Engineering with the Open University and a Certificate in Education with UCLan. In 2008 he completed a Postgraduate Certificate in Management with Lancaster University and more recently the Aspiring Principals and Senior Leaders programme with LSIS. Mark is hugely proud of the impact that Furness College continues to make on the lives of its students and the success of businesses large and small. Outside of work, Mark is a director of Cumbria Cricket Ltd, having played and coached cricket throughout his life. Married to Deb and a proud father to Christian and Jordan, Mark has a new addition to the family, his cockapoo puppy Cassie. Mark and Deb have the distinction of completing all 214 Wainwright fells of the Lake District. Nicola Cove joined Furness College as Deputy Principal for Finance & Resources in September 2018. After completing a degree in Maths at the University of York, Nicola joined the Accountancy and Audit firm, PricewaterhouseCoopers in 1997 on its graduate accountancy training programme, based in Plymouth. During her training, Nicola worked with a broad range of clients from small farm accounts to SEC-listed companies to colleges, universities, regulated charities and other third sector organisations. In 2000, Nicola completed her chartered accounting exams and became a Member (and more latterly Fellow) of the Institute of Chartered Accountants in England and Wales. During her six years at PricewaterhouseCoopers, Nicola specialised in the public sector, and within that, predominantly further education. Nicola then moved into the FE sector, joining City College Plymouth in 2003 and rapidly rose through the ranks becoming Director of Finance and ultimately Deputy Principal. Nicola is passionate about further education and its impact on the economic, social and cultural development of the Furness area and wider region. In her spare time, she enjoys travelling the world, reading, is an avid sports fan and an enthusiastic, but strictly fair-weather golfer. Zee Walker joined Furness College in 1997, starting her career within the field of European funding. She has progressed within the college, enjoying a number of roles including Contracts Manager, Quality Manager and Director of Information before commencing her current role in Planning, Performance and Quality. Before graduating from Lancaster University in 1997 with a BSc in Operational Research, Zee attended Furness College as a Business and Finance student. It was this time at Furness College which sparked her passion for education and she has experienced first-hand the impact a community college can have in changing lives for the better. She has continued to develop her skills within the field of IT, gaining a Foundation Degree in Business Information Technology in 2006. She enjoys the challenges faced in her current role and feels privileged to work alongside highly talented staff who are committed to providing a high quality learning experience for all students. In her spare time she enjoys sailing, cycling, reading and walking her two Old English Sheepdogs. Steve McAloone is Director of Curriculum, Technical and Adult Learning. He is a qualified engineer who left school at 16 and commenced a traditional apprenticeship in the shipyard in Barrow. He entered the FE sector in 2000 following 12 years in retail. During his time in FE, Steve has undertaken a wide range of roles from Learning Support, Work Based Learning Assessor and Lecturing before becoming Curriculum Manager. He was responsible for the project management of the new £4m Advanced Manufacturing Technology Centre at Channelside. 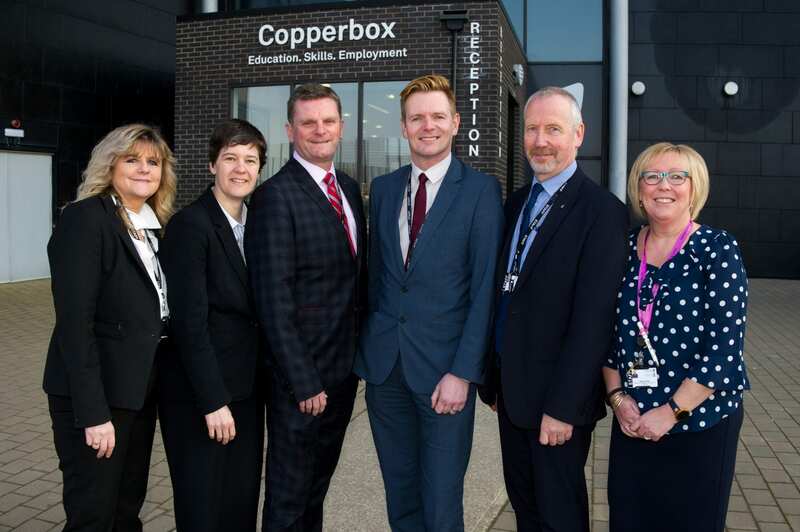 This new facility allows the college to deliver key elements of the Cumbria LEP’s priorities in the south of the county as part of the governments STEM agenda. It was completed in July 2016 and, as the hub of innovation and skills in the area, houses state-of-the-art technology. Steve is a non-executive board member and North West regional coordinator for the National Forum for Engineering Centres (NFEC) and has worked with the New Engineering Foundation as a STEM Assured Advisor. He was awarded Lecturer of the year in 2014 by the Cumbria Newspaper Group. He has a passion for German engineering and his ambition is to refurbish a split-screen vintage VW camper van. Sue Hannan is Director of Young People’s Learning. Sue previously held a senior management position at Barrow Sixth Form College having worked there for 20 years, initially as a Tutor of Health and Social Care before moving in to management as Work-Based Learning Co-ordinator, Senior Tutor and latterly as a Director. Sue initially qualified as a Registered Nurse in 1986 and spent some years working as a Staff Nurse followed by a period as an Occupational Health Nurse Adviser with British Gas. Having graduated from University College of St Martin with a BA (Hons) in Health Studies in 1996 Sue moved into the education sector completing a PGCE in post-16 Education. Sue is a Barrovian and an ex-student of the sixth form college. Still teaching in the classroom, Sue is proud of the progression her students make to Higher Education to become the nurses, teachers and social workers of the future. Outside of college, Sue is married (to the boy she met as a student at sixth form! ), she enjoys walking her Tibetan Terrier Mylo around the Furness area and the Lakes, is an keen skier and is often found with her head in her Kindle reading.